The forthcoming Bentley Flying Spur plug-in hybrid variant has been spotted testing again. Our sources suggest that the electrified luxury four-door will sport the 3.0 litre V6 hybrid powertrain that currently features in the Bentayga Hybrid. The unit also serves in the Porsche Panamera E-hybrid, in which it produces 462 PS and 700 Nm of torque in that application. Given that the forthcoming Flying Spur shares its MSB platform with the Panamera, it is also possible that the Bentley could adopt the plug-in hybrid 4.0 litre biturbo V8 that tops the Panamera range in Turbo S E-Hybrid guise, where it produces 680 hp and 850 Nm of torque. Development of a PHEV variant extends to its two-door sibling as well, as our spies have also observed. Should the next Flying Spur follow tradition in terms of powertrain, this can be expected to include the 6.0 litre W12 twin-turbo that produces 626 hp and 900 Nm of torque, which serves in the current Continental GT, as well as a biturbo V8 further down the line. 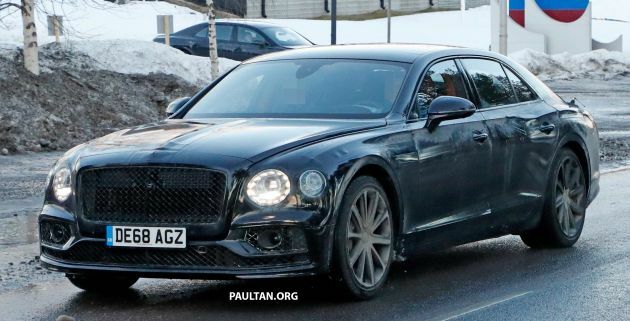 The post SPIED: Bentley Flying Spur PHEV seen testing again appeared first on Paul Tan's Automotive News. 0 Response to "SPIED: Bentley Flying Spur PHEV seen testing again"